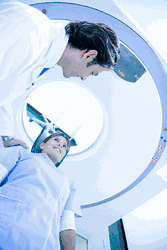 Magnetic Resonance Imaging (MRI) machines are very noisy (and sometimes even scary) places to spend time. Fortunately, most MRI labs now offer patients the option to wear ear muffs while inside the machine, where the noise is loudest. We offer several ear muffs that are completely safe for use in and around MRI machines, and best of all, they are much less expensive than similar products sold by medical dispensers. Note: check with the MRI center before planning to take your own hearing protectors. Some centers will not let you bring your own. All MRI centers will provide you with hearing protectors, so bringing your own is a personal choice. Look for the MR Safe Green Logo. Many other products may also be MR Safe, but those on which we show the MR Safe Green Logo have been certified as such by the manufacturers so you can buy with confidence when you plan to use these hearing protection products in an MRI procedure. If you would prefer another product, just give us a call and we will help you make sure the product you want is also MR Safe. NOTE: Virtually all foam earplugs and reusable industrial silicone earplugs are MRI Safe. Only those marked as "metal detectable" are known to cause problems when used in MRI machines.